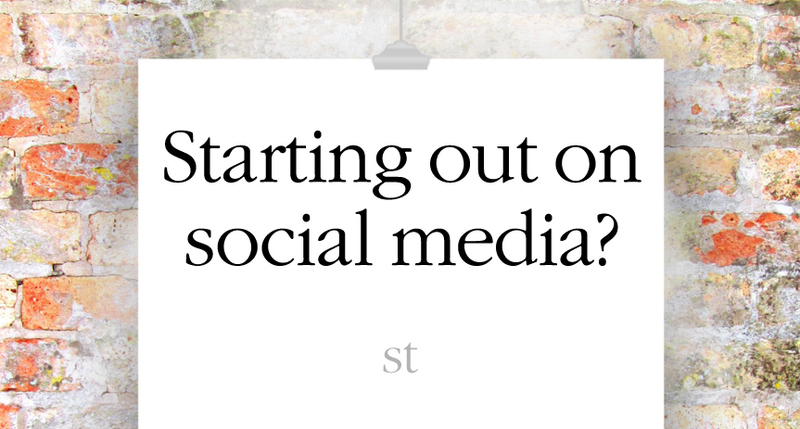 Starting out on social media? 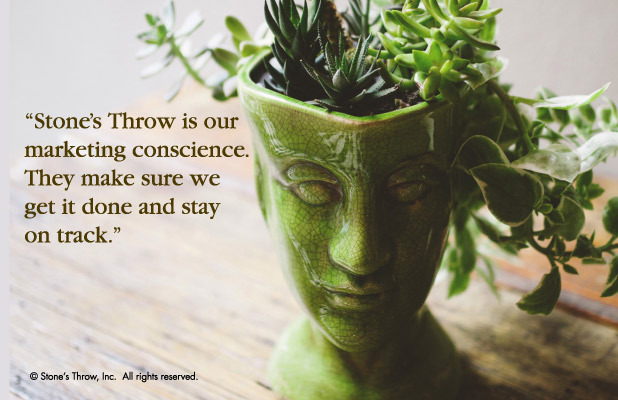 Starting out, we at Stone’s Throw often coach clients with smaller and medium-sized businesses to use social media initially as a way to demonstrate vitality, interest, and enthusiasm by showing activity on social media platforms. Let the world see your public face – especially if your potential customers use social media. Ensure that your posts are consistent with your brand image and messaging, and please make sure that you have a system for post approvals, monitoring, and responding. Awareness ads: Paid social media advertising is a way to create energy and push your posts into the newsfeeds of your selected audiences. These ads are often referred to as awareness ads; they boost awareness by allowing audiences to see your ad (“impression”). Awareness advertising is often the least expensive of social media placements. Conversion ads: To encourage your audience to take some kind of action (visit your webpage, make a phone call, complete a form, etc. ), social media ads have to work harder and typically cost more. They require the user to move from a passive audience member to someone who takes some kind of action. This is often referred to as conversion. Engagement rate: Most social media platforms use metrics to describe the types of interaction your posts generate. Engagement rate refers to the number of likes, shares, and comments your posted content receives. Should your business advertise on Facebook or LinkedIn? Here are a few things to consider. 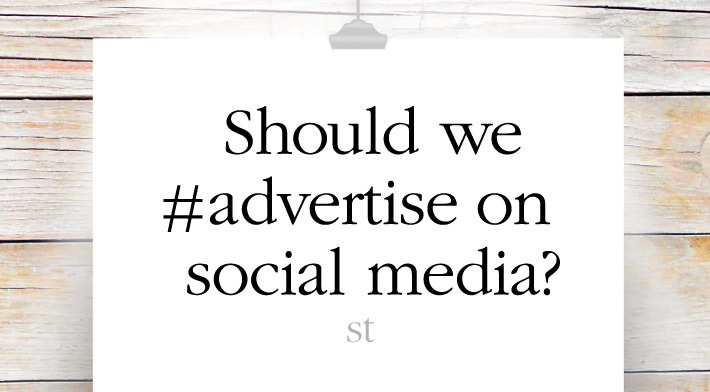 Should we advertise on social media? Unlike traditional print advertising in which we pay for the amount of space on a page and the number of issues in which an ad will appear (for example), social media advertising offers many avenues to get ad messaging in front of potential customers. The costs are determined, not just on a set amount per exposure to that audience, but in competition with others vying for that same audience. If it sounds like we’re talking about an auction, we are. For much social media advertising, you actually bid on getting your ad in front of your audience. You will notice terms like pay-per-click (PPC) associated with bid-based advertising. Other options of setting fixed prices to reach verified target markets on social media require a larger investment and are available mostly to big brand advertisers. When we at Stone’s Throw think of social media advertising as part of the overall promotional activity of a smaller to medium-sized business, we focus much more intently on moving prospects closer to you. How can we get that prospective customer close enough to have a conversation? That conversation can happen on a social media platform, yes, but for businesses like ours, we want to have that conversation privately. We want to ask questions that reveal challenges, exchange ideas, and answer questions as the consultative souls we are. So, one of our promotional goals is to spur a one-on-one exchange, either through email, telephone, video conference, or an in-person meeting. If social media advertising can get us to that goal, we think it could be worth a trial run. Start small. Assess. Branch out. Just starting out on social media? Here are a few things you should know. Larger companies typically understand how to leverage their marketing efforts to grow business. Part of that understanding is manifest in an institutionalized lead qualification and sales process. Salespeople undertake rigorous training on the features and advantages of products and services, how to use recommended marketing materials, and even how to overcome customer objections. But, having a workable sales process helps businesses of all sizes. You likely have a sales process already, even if you haven’t memorialized it in print. Have you tried writing it down? Not only will it help you save time with each prospect, it will help you identify where you could lighten up or fortify activities. We know it’s all about making connections and building relationships, not about getting caught up in data entry and recordkeeping, but outlining your process is likely to help streamline your efforts for optimal effectiveness. Whether you are an entrepreneur or you market a growing mid-size business, reviewing the phases of your company’s selling process will help you ensure you have all the tools necessary to build your business with increased opportunities. Download our quick guide to getting organized with your sales process. For ideas on how to position and market your business, let’s talk. Give your salesperson all the communications material needed for optimal performance: introductory email content, an informative website, capabilities brochures, spec and sell sheets, email marketing campaigns, and even telephone scripts for initial calls and recommendations for online CRMs. Whether creating a single promotional piece or an integrated marketing campaign, all marketing communications efforts benefit from planning. Of course that planning might take place in a very compressed time period (“You need that by tomorrow?”), but experienced marketers consider brand, positioning, communications objectives and audiences (among other factors) before they ever put pencil to paper or cursor to blank screen. The plan is never written in stone (pardon the pun); it lives and breathes, allowing for changes when new data comes in or new opportunities arise. Mapping it out ahead of time simply sets our primary direction, but it goes a long way toward reducing the intimidation factor. For some clients, we have the privilege of planning full multidimensional campaigns that build over time on the successes of key components. We often begin with the marketing activities that help create a presence for the company or product – perhaps brand identity (logo, tagline, positioning statement), key brand messaging and language, capabilities materials, website, print and online advertising, and press releases. The second phase may include activities that soften the market for business development or sales efforts – always leveraging relevant content development – email marketing, direct mail, seminars or community programs and social media. Finally, we explore activities and materials that will be used to fulfill the inquiries generated by the new marketing efforts – maybe product- or market-specific sell sheets or product information, packaging, newsletters, blog posts and white papers. For others, we’re tasked with creating one special element of their marketing or promotional material. 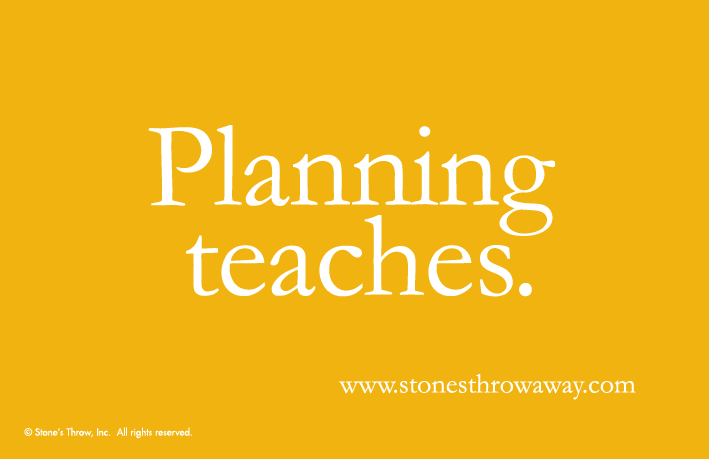 Even in that case, we ensure our work dovetails into the overall plan and the communications strategy. It often takes only a few moments to confirm that we’re on track, and that can make all the difference. Over the course of nearly 25 years, we’ve had the privilege of working with many fine businesses and organizations. Those most successful at engaging their target audiences — and manifesting brand language that resonates with customers — have one important characteristic in common; they understand the power of planning. It’s that time of year again. Many seasonal celebrations dot the fourth quarter like the holes in Swiss cheese, making the coordination of schedules more challenging and finishing team projects less likely. Where many of us see this time as providing welcome breaks for refueling, some of us see it as an interruption in the momentum we’ve worked diligently to generate over the past nine months, or as a time to cram to meet the fading year’s goals and objectives. Where do you fall? Whether traditional, national or religious, holidays are a part of our shared experiences during the late autumn and early winter weeks. They also offer a built-in reason for business owners and marketers to reach out to clients and prospects. Is holiday marketing part of your business plan? 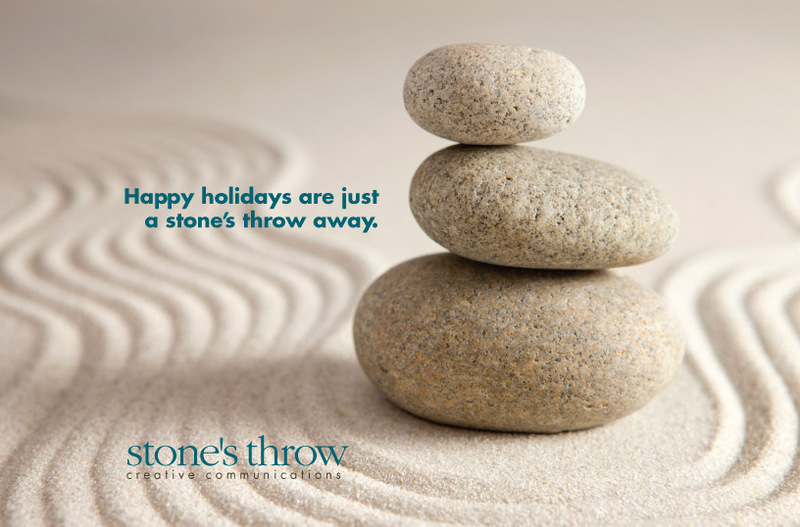 Think about how a few holiday communications may meet your company’s marketing strategy. Let’s get beyond the holiday card and email. (Although, let’s not forget them.) Have you planned an open house with a theme that reflects your new proprietary technology? Are you hosting a client appreciation event that features a 10-minute presentation on how your services benefit the attendees? Will you count down to New Year’s Eve with a cool tip each day that you’ll post on social media? Will your business sponsor a charity’s year-end festivities or a community playhouse’s December performances? If you haven’t already, start planning. And, if you need a bit of help, give us a call. Happy holiday season! Enjoy it all. Tap into creative and marketing support when you need it – defined by the project or based on time. What could make more sense? 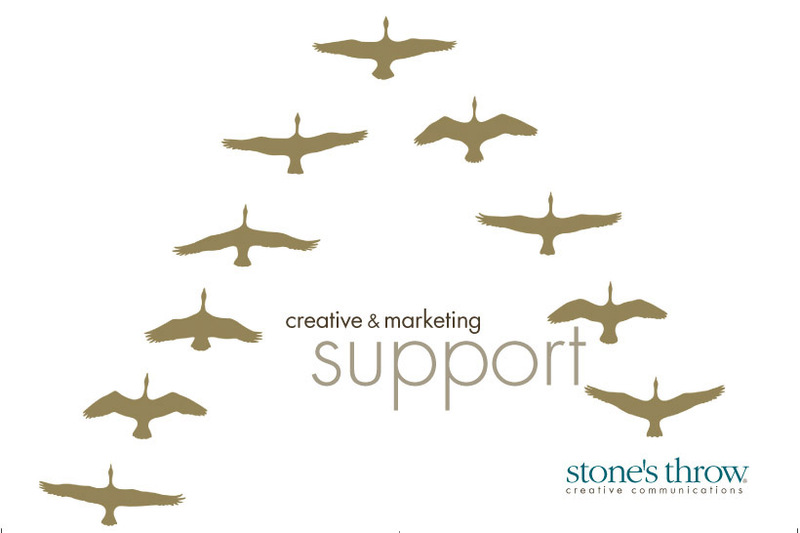 The support we provide to our clients sometimes puts us in mind of geese flying in a V formation. Scientists believe that this geometric configuration helps each bird conserve energy by reducing wind resistance – each bird taking its turn at the front. It also helps the geese look out for each other by maximizing visibility. I’m sure you know that human pilots have long mimicked this flying pattern to provide protective support to the lead plane. Think of us as your creative wingman. Call Deanne or Janice at 609-395-0650. Hello. Thank you for inviting us here today. 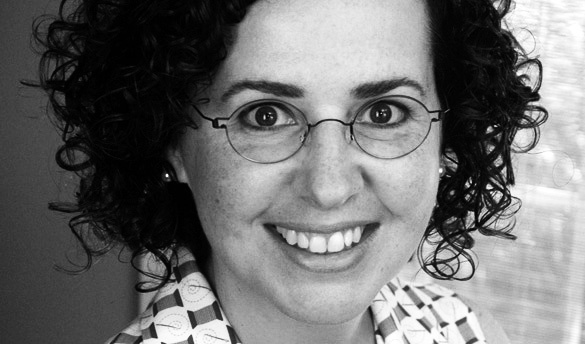 My name is Deanne Napurano and I’m one of the founding partners at Stone’s Throw Creative Communications in Cranbury. I’m also a copywriter and creative director. 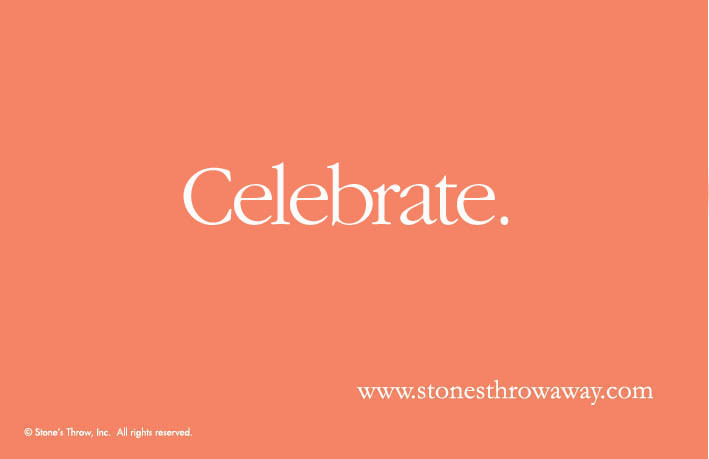 Stone’s Throw is what is often considered a boutique-style marketing firm – we’re small, offer flexible working arrangements, and are devoted to our clients. We work primarily with clients in professional services – law firms and accounting firms – and with clients in biotechnology, healthcare and life sciences. Although our work is mostly business-to-business, we provide direct-to-consumer support for several clients as well. It makes sense that over our 23-year history we’ve built relationships with many and diverse clients. The marketing and advertising landscape has changed dramatically over the past two decades. When we began it was quite uncommon for attorneys to advertise at all. Now law firms market themselves with tremendous sophistication – often taking advantage of trends enabled by computer technology and online opportunities. I’d like to review quickly some of the more successful marketing activities employed by law firms and lawyers today. I’d also like to introduce you to the concept of a communications strategy – the plan for ensuring each marketing activity reflects your brand and messaging. And, I’ll introduce you to a fun and easy way to focus the tone and personality of your communications strategy. With 80% of Americans using the Internet, most companies understand the value of having a website. It’s certainly your online business card (to say the least). But, your marketing activities, whether at the firm’s corporate level, or in your day-to-day contact with clients, can be so much more than that. If you conduct a quick Google search for ‘marketing for lawyers,’ you’ll find a list of important activities that include online legal directories and listings, print and online advertising and brochures, publishing articles to online journals and websites, contributing content to blogs, leveraging social media, and, even creating online videos. Your firm is already engaged in many of these practices. How do we choose which activities are right for a client? 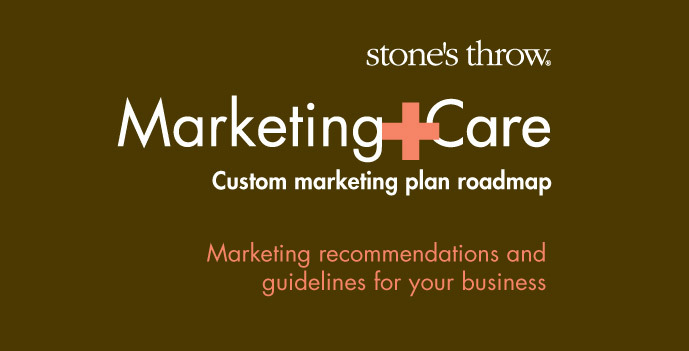 Understanding your business objectives helps a company like Stone’s Throw audit opportunities and recommend activities that will help raise awareness of your services by putting your story in front of the audiences you’d like to reach. In essence we go where your customers are. We meet them where they are spending time. Sometimes that’s a news magazine; sometimes that’s a train platform. But what about the marketing activities that some of us don’t talk about as much? Like, how you greet and actually shake hands with new contacts, how you handle referrals, how you share your knowledge and expertise face to face, how you show appreciation for your business relationships, and how you give back to the community. How do you ensure that your brand intention is manifest in your client’s experience with you? No matter how much business your firm initiates through activities that drive people to your website – inbound marketing â€“ it’s the real-time communication and human connection that can still make or break any relationship. To be the most effective and satisfying for you and your clients, the tone and quality of that communication and connection should reflect your values and your client’s needs – because your values, if aligned to what you do, are defined by those you serve and why. On to the more tangible? When a company like ours creates a logo, a website, a brochure or an introductory letter, we build a creative brief or communications strategy. We ask or learn from our client about his business, who he serves, what his marketing objectives are, and so on. We then use what we learn as a guide to create copy and design that resonate with his audience. For some clients, one of the sticking points in this process is the question, ‘What tone should this marketing activity reflect?’ In a simple question we are actually asking about the character of the work, which is in effect the character of the brand, the character of the company. Knowing the desired tone, we can use color, language, design and visuals to evoke that character. Sometimes a client will understand tone precisely. Perhaps it’s an accounting firm that wants its marketing to evoke a sense of exacting accuracy softened by human warmth. Or, an architectural firm that wants to align itself with green and eco-friendly practices for designing and building K-12 schools, and a sense of ecological whimsy is appropriate (think Kermit the frog). But sometimes a client may not be as clear. Perhaps the brand of the firm has evolved over the years as different practice areas grew. Or perhaps there’s a disconnect between the firm’s defining vision and its public image. Or it’s a new business defining itself for the first time. In that case we will often ask – of the solo entrepreneur or the executive team of 15 – If your business were an animal, what kind of animal would it be? Instantly, people begin to understand how to communicate character and tone. Whether it’s a specific breed of dog or a species of wildcat, we all associate certain universal traits with animals. Start to think of it now . . . what animal or dog breed would this firm be and why? What about a client’s business? Is it methodical and sure-footed like a mountain goat? Or quick, smart and acrobatic like a Jack Russell Terrier. You can imagine some of the conversations we’ve had! This is a little insider’s trick to help get the conversation going when it comes to defining the character of your marketing. Which, as I mentioned is essentially all of your communications – public facing or otherwise. I hope you found this helpful today. If we have time my partner, Janice Mondoker, our firm’s Senior Art Director, and I will be glad to answer any questions now or afterward. Again, thank you for inviting us. I hope we’ll have the chance to talk or work with you sometime in the future. 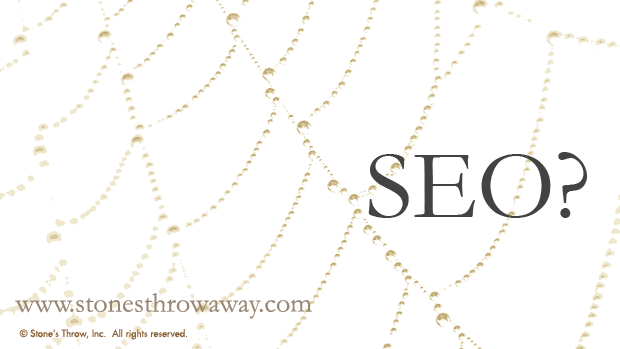 Recently a client confessed to us that he had allowed a third party’s search engine optimization tactics to hold his website content hostage. As a career medical professional, he had a wealth of published work, and he also used, and wrote about, very specific approaches to patient care. He admitted that at some points his website content had been so affected by SEO-driven edits that it was no longer accurate. He was also getting calls from patients who had found his website during an online search and were in extreme need, but were not appropriate for his practice. He began spending an inordinate amount of time redirecting patients to more appropriate healthcare providers or other organizations that might help. The time and distraction began to eat into his practice and his peace of mind. In this case, SEO completely consumed the business’s marketing budget while driving inappropriate users to its site. Yes, it increased traffic significantly, but the conversion to real business, or at least to phone conversations or email exchanges with potential clients, was negligible. In fact, it was zero. This was an extreme case, but it was a wake up call for all of us. Don’t let concern about search engine visibility get in the way of telling your story, being your authentic, customer-focused self, and creating a branded user experience. People want to do business with someone they know, like and trust. And, that’s you and your business. Understand and use the phrases and words associated with your business; what are your potential customers typing into the browser search box when they use Google or Bing to look for your services online? Use those keywords organically in your website’s live copy, in headlines, blog content, title tags, etc. Don’t restrict your copy to bulleted items; feel free to add in-depth explanations for each of your services, products and approaches. Use outbound links to credible, authoritative sites. Perhaps link to product pages and other resources for your customers. Use great images, videos or diagrams of your process with descriptions and captions. Use social sharing buttons and engage with customers on Facebook, Twitter, LinkedIn, Pinterest, Google+ or anywhere else your clients frequent. Make sure the business (and its website) is listed in appropriate directories. Remember, an integrated marketing program is essential to support your online presence. The goal is to make introductions and foster relationships – to put you together with prospective clients – not simply drive traffic to your website. As you would when hiring any professional, if you’re going to contract with an SEO or search engine marketing solution provider or partner, be sure you do your homework when it comes to having your site audited and subsequently improved for greater search engine visibility and ranking. Be careful not to hand the reins over to a service provider who’s more driven by analytics than by business building. Yes, give serious consideration to how your online presence can and should be seen by search engines – where your content can be exposed, or made more visible, to browsers – but, first and foremost, give your potential customers a glimpse into what it would be like to work with the real you.